I would like to thank you for assisting me in purchasing Q23. You were very professional, easy to deal with and very prompt in responding to my queries. I look forward to buying more plates through your company in the future. Within two hours of him receiving my listing, my Qld Heritage Number Plate was sold. He was excellent throughout the whole process, with regular updates on payment and settlement. Purchasing my latest 2 digit Qplate from Scott (qplate.com.au) was a very simple and seamless process. All funds were safely handled and completed professionally. I was more than satisfied with the courtesy and attention to detail displayed by Qplate.com.au during my transaction to purchase Q88. A substantial sum of money was involved but the checks and balances your company has in place are exemplary. Well done! I recently purchased a Q Plate through Qplate.com.au web site. Nothing could be easier as the transaction was completed in record time. It is a breath of fresh air to have someone create a professional service for our treasured number plates. I will continue to support him in order that his service remains viable for the betterment of all number plate collectors. It is important that these special plates are promoted in a professional manner so as to maintain their value and longevity. As a relative newcomer to the market of heritage plates, the assistance that Scott provided me was invaluable. Scott is very approachable, extremely prompt in his response to my queries and also has an excellent knowledge of the market. The whole transaction was a thoroughly enjoyable one. 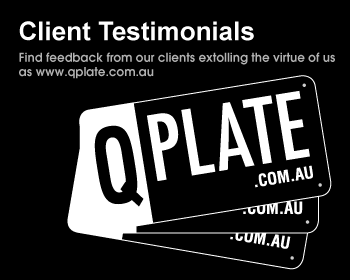 Qplate.com.au has handled the marketing of several Qplates for me. In each instance, his approach was courteous, intelligent and enthusiastic. Whether buying or selling, be assured that QPlates will handle the negotiation, sale and transfer in an absolutely professional manner.